The Cascade area showed the heaviest home sales activity over a three week period. 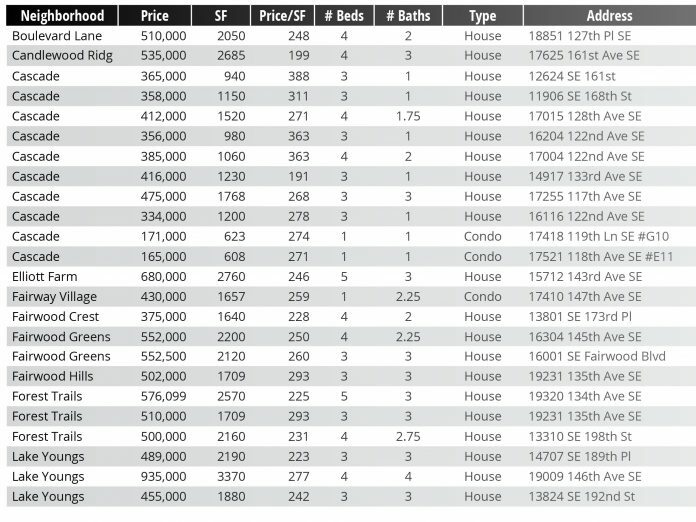 Below includes a list of recorded real estate sales for the Fairwood area, from April 21 – May 11. Sales ranged from $165,000 to $935,000. Area sales covers neighborhoods bordering Maple Valley Highway to the north, Highway 18 to the east, SE 208th St. to south, and 116th Ave. SE to the west. These areas cover 98058, 98031, and 98038 zip codes, which includes unincorporated King County and cities of Kent, Maple Valley, and Renton.